January: The Interplanetary War officially begins. 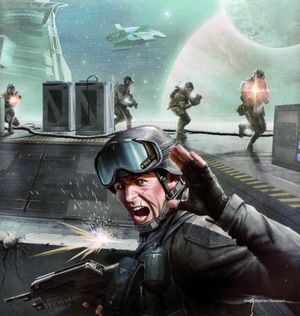 UN-sponsored military forces begin a pattern of massive build-ups, culminating in the first real interplanetary war. After the successful Marine deployment on Mars, recruitment drives and propaganda tactics strongly bolster the nascent United Nations Space Command forces. UN forces defeat Koslovic (supporters of rabid communist hard-liner Vladimir Koslov) and Frieden (a resurgence of fascism) forces on Earth, and then begin a systematic and dedicated drive to crush their remnants on the various planets they hold throughout the system. At the conclusion, Frieden and Koslovic forces are defeated, in the face of a massive, unified and very powerful UN military. The military novel A Soldier's Tale: Rainforest Wars is first published. The first UNSC military bioengineering protocols are created, which would later form the basis of the ORION Project.